Although you might not guess from watching this episode alone if you didn’t know already, Williams, a singer-songwriter, is actually a crucial part of the Muppets canon. The friendship Jim Henson and he struck up in this episode was the beginning of a creative partnership that lasted many years into the future and which brought the Muppets some of their most indelible moments and Williams what he called the most rewarding work of his career. In addition to penning the songs and score for Emmet Otter’s Jug-Band Christmas, he wrote what is arguably the most legendary music in the Muppets’ history: the music for The Muppet Movie, including the immortal “Rainbow Connection,” which rivals “Bein’ Green” as Kermit’s most important contribution to pop culture (additionally, he appeared as the piano player in El Sleazo, the bar in the film where Kermit meets Fozzie). Later on, he would also go on to write the deeply clever and lovely score for The Muppet Christmas Carol–the Muppets’ first post-Jim production–and additional songs for the Emmet Otter stage show, as well as songs for The Muppets’ 2008 Christmas special, Letters to Santa. And so, in many ways, this episode is hugely significant, but there would have been no way to know it at the time, thus my being perplexed that this, out of all of them, was selected for a writing nomination. Even Statler and Waldorf fail to bring the funny a lot of the time. Example: Waldorf: “They can put a man on the moon.”; Statler: “But they can’t put the moon on a man!” I’m sorry, what?! And here’s another: Waldorf: “He’s a credit to his race.”; Statler: “Which race is that?”; Waldorf: “The hundred-yard dash.” Again, ouch. Meanwhile, again, the most imaginative thing the writers find to do with Williams is to joke about his height over and over again. They even make jokes about how they won’t make jokes about his height over and over again. That isn’t to say that none of the gags are funny, because a few are amusing, but it’s repetitive, mostly lame, and fails to find any dimensions to their guest, who is a great musical performer but also not the most at-ease actor. 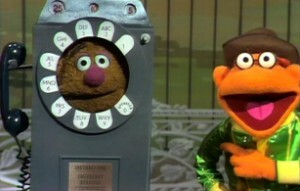 Meanwhile, the completely unreleated plot centers on Scooter giving Fozzie a suggestion for a comedy bit and him trying it out. And that’s it. As these things go, that thread is actually pretty amusing, but what should have been maybe a two-scene gag ends up stretching almost the span of the entire episode. This is Emmy-worthy writing? So, what is good about the episode? Quite a lot, actually. It’s another one of those early Muppet Show episodes made up of some wonderful pieces that fail to hold together into a satisfying whole. As far as the musical numbers go, they are all first-rate. Two beautiful songs by Williams receive loving treatment. “An Old-Fashioned Love Song” begins quietly and ruminatively, with Williams singing alone in a room on a rainy day, but then whenever the song hits its rollicking chorus, the front of a nearby antique radio opens like a door and various Muppet musicians emerge to harmonize with him. The first two are actually Muppet likenesses of himself, the first time that’s happened since the Connie Stevens episode! And later on, the Gogolala Jugband, the Muppet folk singer likeness of Jerry Nelson, and others pour out, finally all piling back inside just in time for the song to finish, like the doorway to a magical world such as Fraggle Rock to which Williams had temporarily been granted access. 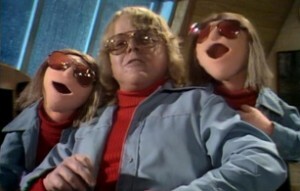 Meanwhile, the finale, “Sad Song,” simply has Williams singing with a group of Muppets on a darkened stage while Rowlf plays the piano, with Floyd, Zoot, and Animal on their respective instruments in the background, but the beauty of the music and harmony makes it a gorgeous, powerful moment for the Muppets and the series. The other major number (tragically missing from the DVD release due to song rights but available here) is an extremely Muppety rendition of the classic song, “All of Me,” whose lyrics go: “All of me/Why not take all of me/Can’t you see/I’m no good without you./Take my lips/I want to lose them/Take my arms/I’ll never use them…” Here, it’s sung by a male Muppet monster to a female one, and he is taking the song’s metaphor entirely literally, taking parts of himself off one at a time and putting them inside a chest for her, until all of him is eventually inside, my favorite aspect being that, through puppetry magic, he actually gives her his arms before he gives her his hands, so for a while, his hands continue to move and operate as normal, even though nothing is actually holding them to his body. The whole sequence is reminiscent of the Sesame Street song, “I Want to Hold Your Ear”, but the gender flip, as well as the removal of some of its even ickier implications, takes away the feminist issues that plagued that number. Then, there’s also a cute little song called “I’m in Love with a Big Blue Frog,” which is mostly notable for the fact that a little girl Muppet, Mary Louise, sings it with a full-on Frog Prince reunion, including Kermit, Robin, and all of the other frogs created for that special! Another extremely notable moment from the episode is the introduction of one Dr. Bunsen Honeydew from Muppet Labs! Here he is, our bespectacled, bald scientist with one of his crackpot inventions, this first one being a tenderizer for your dishes–not meaning the food you make but the actual dishes on which they are placed–which can turn a regular old dish, which is hard and easy to break, into a soft, floppy, foldable thing that’s not actually of any real use but is at least safe from shattering! He also puts some on a soup ladle, causing it to bend, as well. And at the end of the sketch, he accidentally spills some on the table, basically turning it into a mattress! Honeydew was created as a loving gag on those scientists whose focus can be so myopic that they narrow in on minute details rather than the big picture, such as here coming up with a way to fix plate breakage without considering that this method renders the plates themselves unusable, and, as such, it’s an excellent introduction to a much beloved character. However, he is missing one key ingredient, and that is his beleagured assistant/life-partner, Beaker, who beginning in Season 2, will be at the receiving end of his scientific mishaps. And so, despite being good, this sketch feels a bit off today. To even deal for a few short moments with a Beakerless Honeydew seems unimaginable, but nevertheless, it’s a fascinating peek at a character concept that they clearly realized had potential but which needed a foil to really make come alive. There’s also a wonderful sketch in which Rowlf reads a poem he wrote called “Silence,” but this being The Muppet Show, as he proceeds to read it, other characters around him start to get noisier and noisier, often enacting the direct opposite of a line he just delivered. He says some richly metaphorical line about time sweeping by, and George appears, loudly sweeping the floor. A line about creatures crying in the night inspires a bird to start cawing. A line about forbidden fruit prompts Piggy to appear, munching on an apple. 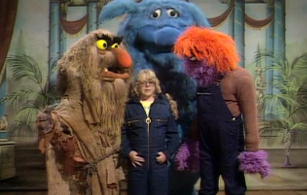 A line about time drumming in his ear, and suddenly Animal is banging on the drums, and so on and so forth, until ultimately, Rowlf gets so frazzled that he yells at everyone to be quiet. And then, who should appear but Kermit asking Rowlf to keep it down, since they’re trying to do a show?! It’s a classic Muppet reversal and features such a perfectly tuned gradual comic breakdown from Rowlf–not to mention it’s also the rare sketch in which Rowlf and Kermit both speak and interact (rare since Jim performed them both)–that it’s a pleasure to behold. SCOOTER: Hello, and what’s your name? SCOOTER: Oh, so you’re the telephone Pole! In some ways, the fact that the punchline is delayed so long actually contributes to its undercutting expectation…in a way, but I’m not convinced that it actually deserves this level of treatment, as it also makes it much more prominent than it needed to or arguably should be. It’s cute enough, but revolve-an-entire-episode-around-it cute? Meh. And, particularly following the Florence Henderson episode, which not only gave its guest star better material but actually integrated her into what was a relatively much more fleshed-out plot…I ask again, why was this one nominated for an Emmy?